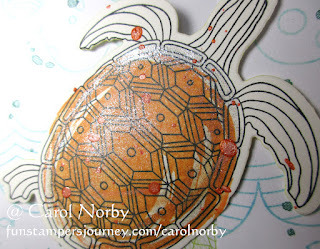 Stampin Carol: You're Turtley Awesome! I've had very little craft desk time this past week but did manage to get this card made. 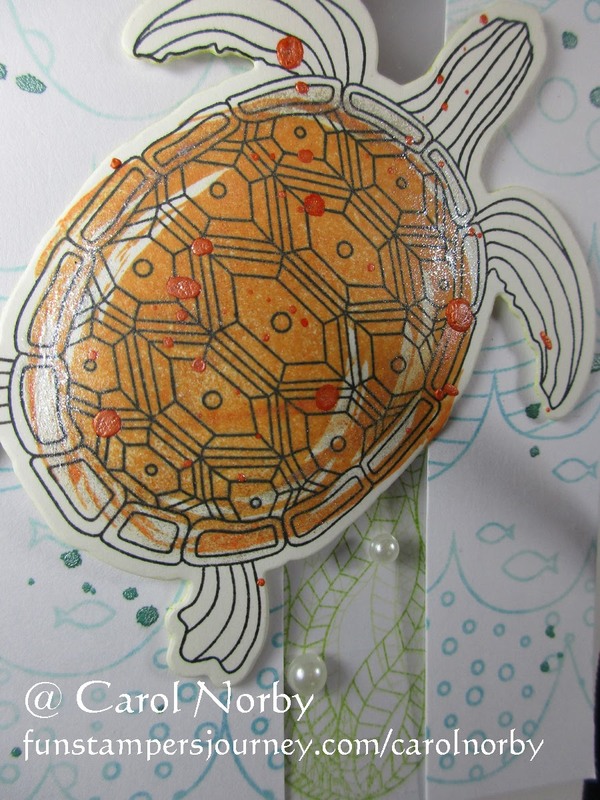 I'm loving the new Under The Sea collection in our Spring into Summer mini catalog. I barely could get the glimmer of the shell to photo but I brushed our fabulous new Sparkle Silk on it. This stuff is so cool that it sold out almost immediately but should be back in stock shortly. It reminds me of the Clear Wink of Stella product and can be put in a Blending Brush (according to a couple coaches) and used that way. I will try this soon to verify. The background waves stamp is our Catching Waves background stamp and I inked it with 3 different blue inks. I then splattered it with Cool Pool Silk. I cut out a 3/4" section and adhered a piece of acetate from some packaging I had. Our Clear View Sheets are perfect for this but I don't have any. I'll add a package of it to my next order. 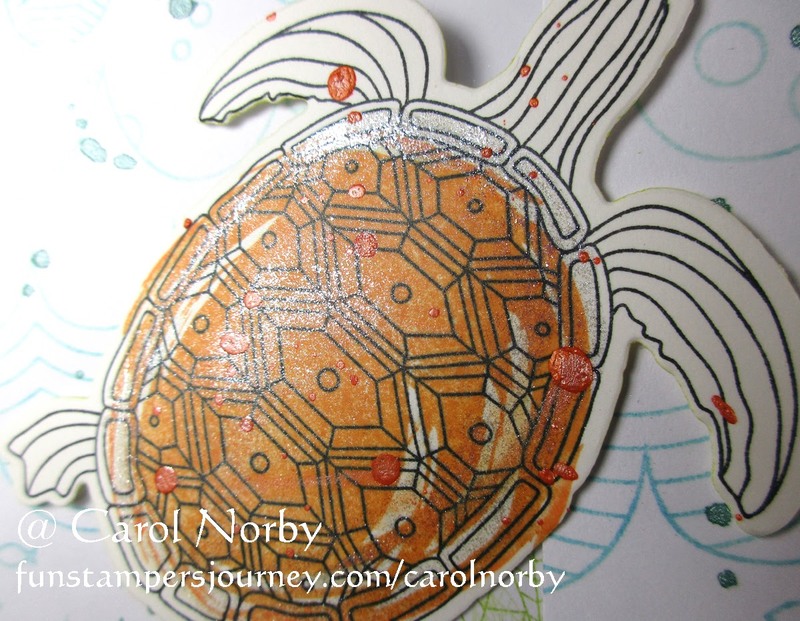 I added some Pearls around the turtle to represent bubbles. 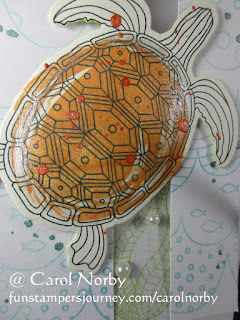 Inside the card I stamped the sea weed from the Turtley Awesome stamp set in Kiwi Slice ink. I have so many new stamp sets that I have yet to ink. After I get my card kits made for my Friday class I can play! Please remember that FSJ will be changing servers in a couple weeks so all my product links will be wrong after that. But the new site will be so much better and more user friendly. I have seen screen shots of parts of the site and I LOVE it and you will, too! I love your card! 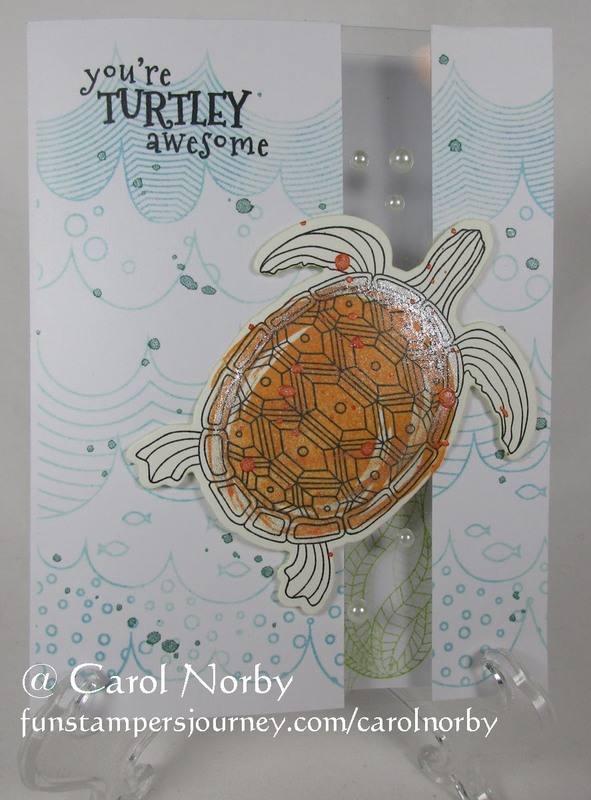 It is "turtley awesome!"